Seeing as we are still in eager anticipation of Isa‘s upcoming third album Echo, it is time to explore the icy roots of this atmospheric black metal project from Siberia. Na Sever is the moniker under which Alexander Rastvorov (vocals, folk instruments, drums, keyboards) and the late Vladimir Mitrokhin (guitars, bayan, keyboards) released an EP and two full-length albums between 2011 and 2013, before they formed Isa. While Rastvorov confirms in his soon-to-be-published interview with Black Ivory Tower that Na Sever is to be seen as proto-Isa, the project still has idiosyncrasies which separate it from its spiritual successor, which justifies our turning back the clock a few years to look at one of these forgotten records. Particularly Na Sever’s debut EP, Slava neizvestnogo nikomu (EN: ‘Glory to the unknown nobody’) sees the duo summon sentiments similar to those evoked by Isa, yet in a way that is noticeably distinct from Rastvorov’s more recent exploits. With the caution that both projects are elusive to strict genre delineation, a rough distinction between Na Sever and Isa is that the sound of the former was considerably more dominated by doom; Isa took the atmospheric black, folk, ambient and darkwave influences that were already present in Na Sever and developed them into their own unique fusion sound. With Slava neizvestnogo nikomu being the first of Na Sever’s three releases, said fundamental difference is best illustrated through this record. With four songs spread across 22 minutes, Slava neizvestnogo nikomu moves beyond proof-of-concept by sparing no expense to unveal the unabridged beauty of Na Sever’s sound. The music crawls forward at a slow pace, enwrapped in the kind of darkness that is foreboding rather than depressing in nature. In line with Na Sever’s heavy, trodding sound, the vocals primarily consist of death growls, contrasting Isa’s more black metal-flavoured singing. Many segments are dominated by Rastvorov’s keyboards, while his folk tendencies occasionally emerge in the form of native instruments and tribal rhythms — particularly at the beginning of the first song “Ne vernus” (‘I will not return’), and on the ambient interlude “Moya lyubov – smert” (‘My love is death’). While this release conforms to the inextinguishable Russian tendency of throwing hints of folk into virtually every music style, Na Sever’s traditional roots can scarcely be compared to Westernised folk metal bands such as Arkona and Grai, whose up-beat party riffs and ever-present recorders might deter those who do not have a tooth for such sugary sounds. By contrast, Na Sever’s folklore emerges from the music in a much more natural fashion, with the occasional jaw harp or bayan merely underlining the unbridled desolation of Siberia that has permeated every aspect of this record. Indeed, it is no coincidence that these Siberians would express their traditional influences through the solemnity of the vast wilderness that encroaches on them from all directions. Folklore to them is less a Romantic return to or re-interpretation of the past than it is embracing the original humility of the human experience, which still pulsates through the taigas, mountains and groves that stretch out in front of them . These influences flow directly from their consciousness into their art; as such, there is no need for detours along the trodden paths of flutes, frills and funny outfits. 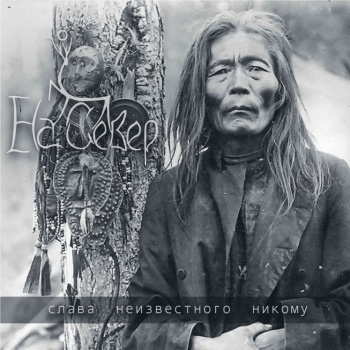 Not just Na Sever and Isa display this sober take on traditional influences: many atmospheric black metal and folk bands from Siberia have a comparable disposition: Knyazhaya Pustyn, Lesnoy Tanets, and even Amur natives Volh (while they are guilty in the silly outfit department). It is as if the direct proximity to intimidatingly vast forests discourages the over-the-top festivity that more urban bands commit themselves to; where their songs desperately attempt to recreate some 19th-century idea of a royal feast, Na Sever’s Slava neizvestnogo nikomu is better understood as the auditory version of a lonely trek through nature. No pretenses, and far away from all the nonsense that humans tend to come up with when they are bored. The kicker is that even a city-slicker from wilderness-deprived Holland such as yours truly would connect to this music far better than the rockstar folklorism of the Eluveities of this world. Na Sever utterly succeed in cultivating a sensation of reclusiveness through their music. Arising from the arcane beauty of nature, Slava neizvestnogo nikomu inspires silent contemplation rather than pompous gaiety. Possibly as a result of their still lacking experience, the songwriting on this record occasionally lacks the ambition of Isa’s compositions, which follow a pattern of being frontloaded before delving into stretched-out atmospheric movements. Consequently, these four songs may not always be as immediate and captivating as Rastvorov’s later work. However, when we let go of this high standard, what we behold is a record that –in well under a half hour, mind you– transports the listener to the heart of the Siberian wilderness like few other artists ever could. In summation, Slava neizvestnogo nikomu may not be the zenith of these Siberians’ songwriting, let alone when Isa is drawn into the equation, but it is still a chilling metal record that rises far, far above whatever industry darlings are being pampered by the metal press as you read this. Hence our humble attempt to help this wonderful EP break out of its cocoon of obscurity. Featured image by Alexander Rastvorov. Painting by Vasiliy Polenov. I actually get a bit of a Blazebirth Hall vibe – think early Forest or mid-era Branikald – from Na Sever and Isa, just a level more polished (not that says very much) and less gloomy. Isa in particular remind me of what’d happen if you took Summoning and filtered that through the BBG aesthetic.